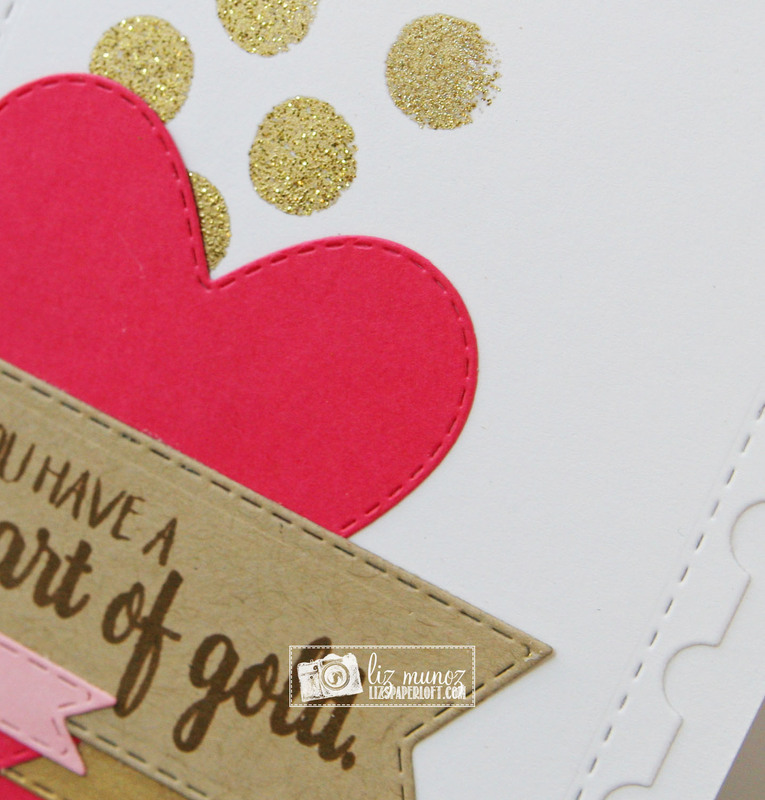 Liz's Paper Loft: MCT June Release Sneak Peek Day 3 ~ heart of gold! 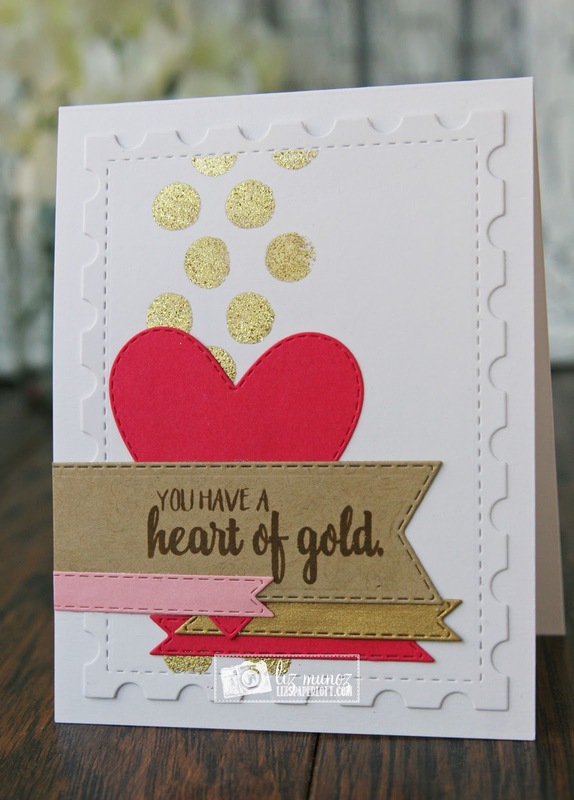 MCT June Release Sneak Peek Day 3 ~ heart of gold! Hi, well we are half way through the My Creative Time sneaky peeks, I sure have been blown away by all the creativity! Today is all about the labels, the Sentiment Label Dies that is. :) This is one, actually I mean three fabulous dies with a "fish tail" on both sides. I love that since it makes it more versatile! I only used two of the sizes of this new die, and yes I did cut off the left side of two of them. I'm a big fan of images being "interrupted". What a very pretty card Liz! I love your use of the banners to create a cluster ... .great focal point and I love the colors! Looks fabulous with the gold circles on the stitched postage die. OMG Miss Liz What a Gorgeous Card you created!! Love the softness of it and the colors. Your embossed circles are so pretty and sure make the heart pop...Great creative way to use the banner dies....you so did an outstanding creative job!! Thanks for sharing your beautiful card. LoVe your pretty gold circles and peeking heart. This is such an elegant card, Liz! Really gorgeous! Such a pretty card Liz!! I love how you incorporated so many of Emma's past and new dies and sentiments!! Love the color combination as well! 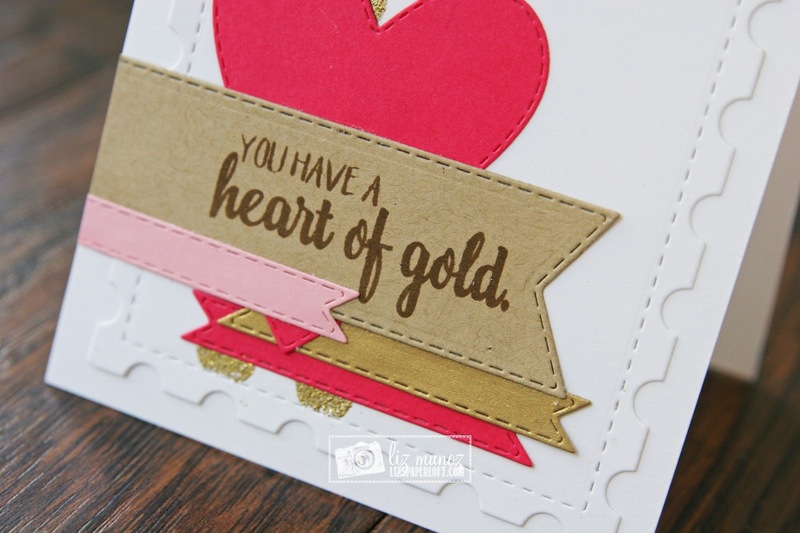 Very pretty with the heart, gold dots and sentiment label. That's a beautiful card. I love the gold dots and all the banners you used. Beautiful card! Love how you layered the die cuts. I never think to do that! Thanks for the inspiration. Also, really loving how the larger sentiments fit into the dies. Can't wait to order mine now! Pretty card with fun layers! Love the gold dots and the label dies you used! Fantastic card. Love the gold and collection of dies. This card is super cute, love the gold and use of the big postage stamp. What a Cute and festive card! Such a pretty card! Love the layering of the banners!! Beautiful card! Love all the layers you created with the banner dies!